Exploring outside of the City of Zante, the geography of Zakynthos can best be described as varied. The western part consists of calcareous rocks, in which beautiful caves are formed. To us the whimsical west coast of Zakynthos is quite similar to the Normandy coast. In the eastern and northerly areas, you will primarily find beautiful and only slightly descending sandy beaches. 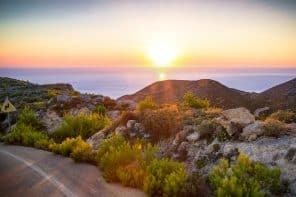 In this article you will learn all you need to know for your holiday touring of the island.We have written about Zakynthos in three different articles. 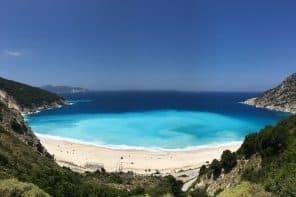 Click for more info if you want to learn more about the capital city Zante or about the nearby located Greek Island Kefalonia. 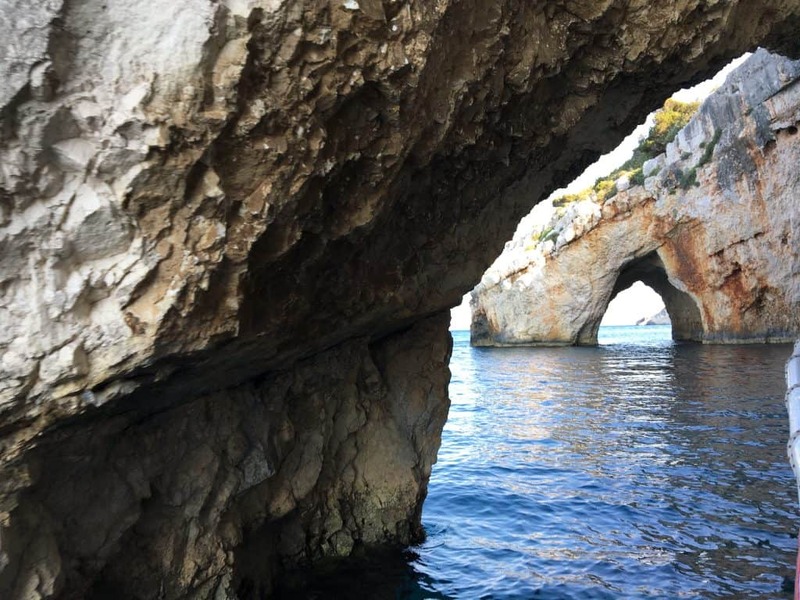 After 3 terrific days in Zante we rented a car and drove to the north for an overnight stay at the hotel “La Grotta” in the port of Agios Nikolaos. It is from here that the ferry departs to Kefalonia. The drive up here featured a beautiful roadway through the mountains with expansive views of the coastline. In the vicinity of Alykes, on a hairpin turn in the middle of nowhere, we encountered a cheerfully painted caravan. 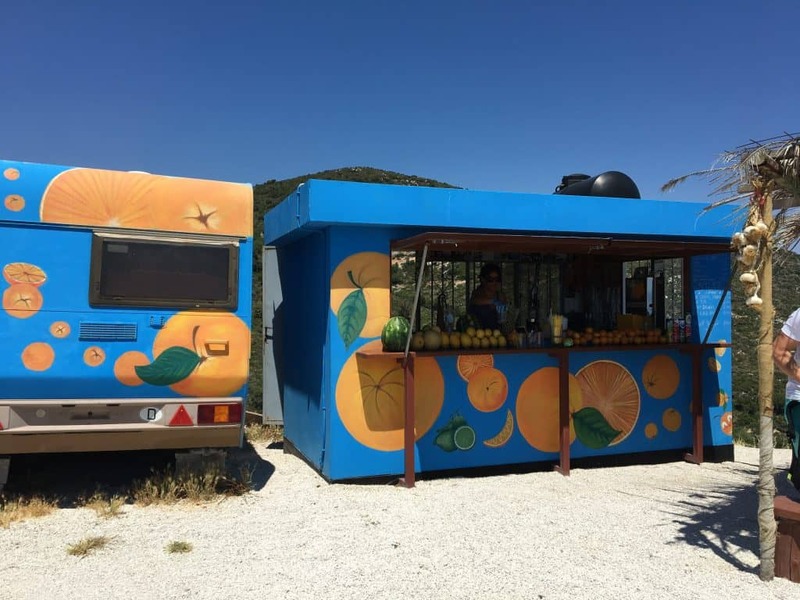 Here the owner not only squeezes fresh orange juice for you, but she also makes coffee in the old-fashioned way. You will have to wait a while for this, because the coffee is prepared and poured by the cup. We weren’t in a rush and enjoying the view from the shady “terrace” was a great break! 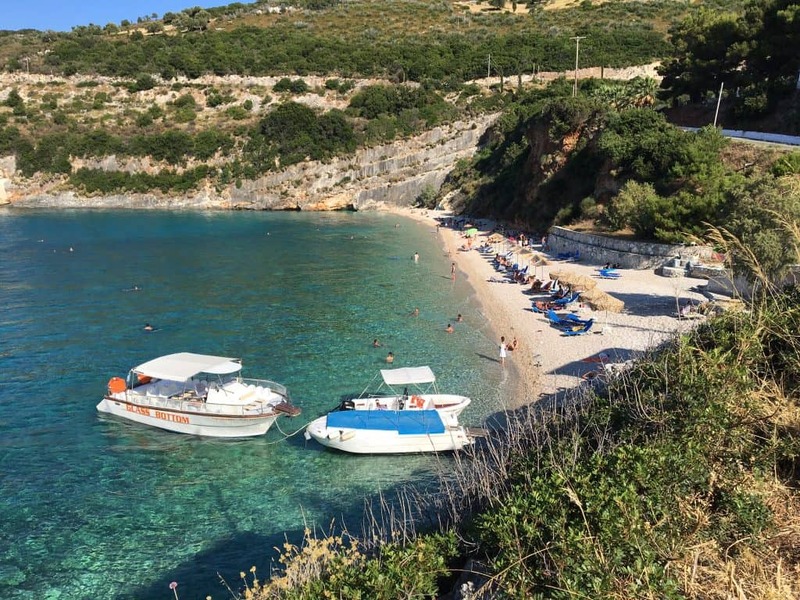 In Agios Nikolaos, the ferry to Pesada (Kefalonia) departs twice a day, in the morning and evening. The night before we had an overnight stay in hotel “La Grotta”, so we could take the ferry the following day early at 09:45. “La Grotta” is located directly at the harbor, only 5 minutes walk from the ferry and is a somewhat dated hotel. 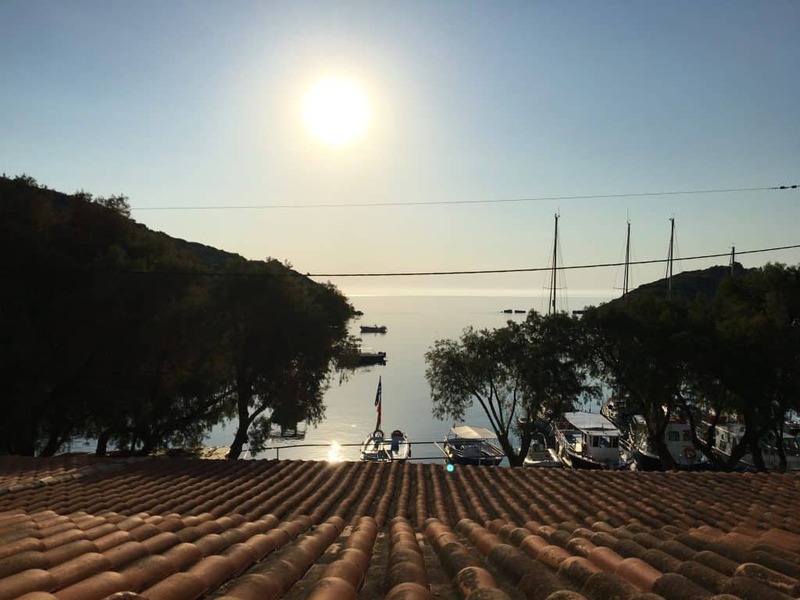 The rooms however are very clean, the beds are fine, the view from the balcony to the sea is beautiful and the price is only 36 euros for 2 persons, including a delicious and extensive breakfast with baked eggs and fresh orange juice, this is highly recommended for those in transit. A special highlight is the hospitality and warmth of a hotel employee named Jelena. She made us feel right at home. It turned out that the only ATM in Agios Nicolaos was out of order and the ferry ticket seller only accepted cash. (My credit card was also useless in this region. Jelena gave me money from her own wallet and just trusted that I would bring it back days later. After a bit of discussion, I accepted her offer and ran off to the ferry, which we just caught in time. Our advice if you go to this region is to make sure your tank is full of gasoline and your wallet is filled with enough euros because there are few gas stations or ATM’s in the north. 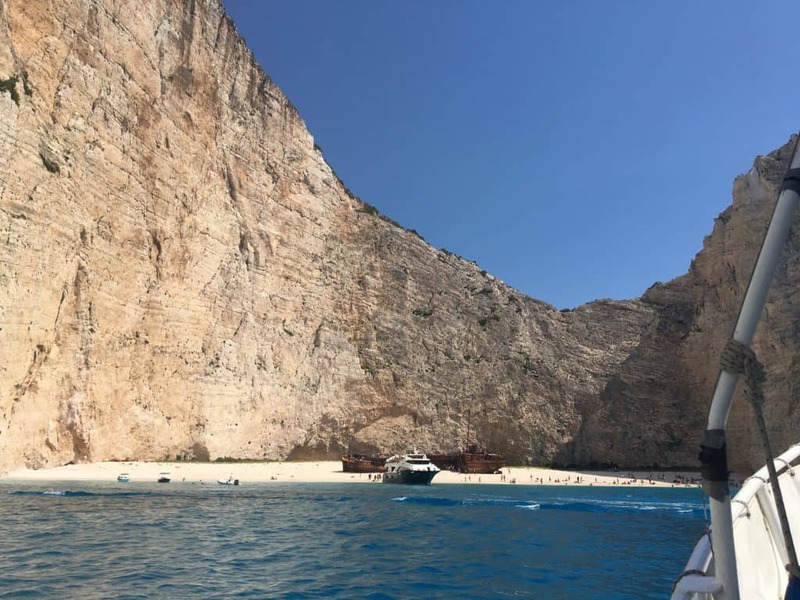 When you stay at La Grotta you will also receive a boat excursion to the Blue Caves and Navagio Shipwreck Bay. All for 36 euros! 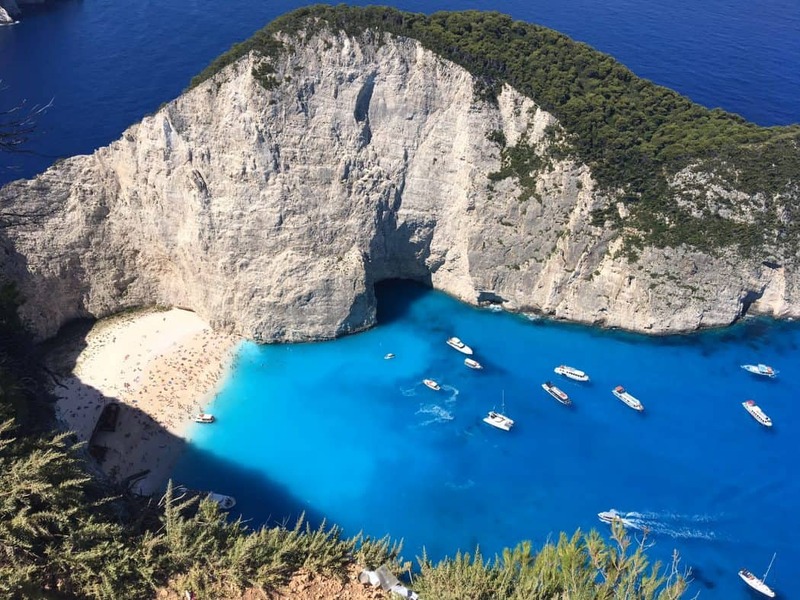 The Navagio beach on the northwest coast of Zakynthos is only accessible by boat. The beach is named after the wreckage, with Navagio being the Greek word for shipwreck. If you fly with clear weather over Zakynthos, you can see the white pebble beach with the ship that was stranded in 1980. They say that it was a cigarette smuggling ship that was on its way from Italy to Turkey. The boat trips cost about 15 euros and are usually combined with a visit to the Blue Caves near Skinari. The water at the Blue Caves is crystal clear and turquoise blue by the reflection of the sunlight. Once again, the trip is free if you are booked at the hotel “La Grotta”. There is also a stopover at Shipwreck Viewpoint near Anafonitria. From this viewpoint you can take spectacular photos from a small platform of the Navagio Shipwreck Bay 300 meters below. The platform is generally crowded because the most beautiful photos are taken from it. You will also see many tourists in precarious locations on unsafe paths due to the platform’s overflow. We stayed for another week in the west at the all-inclusive Hotel “Grand Mabely” in Kampi. 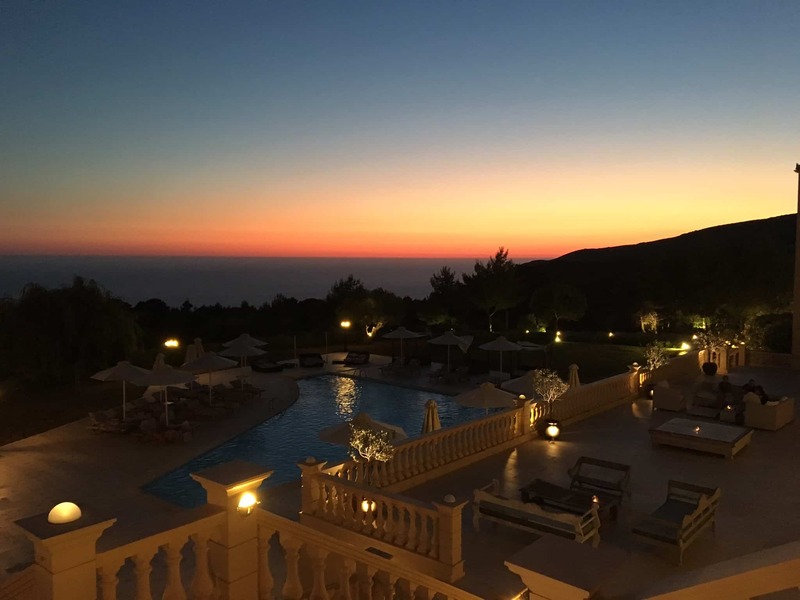 Kampi is famous for its beautiful sunset, including views from the restaurant “Sunset Michali’s Taverna.” The setting sun and slowly black coloring contours of the landscape provide a dramatic nightly panorama for the restaurant. Also in the west, Porto Limnionas is hidden between the steep rocks. You reach this bay through the mountain village of Agios Leon via a steep, winding and narrow road down the mountain. There is no sandy or pebble beach, but you can rent nice platform beds by the day (2 beds with mattresses and umbrella for 6 euros). Bring water shoes if you want a dip in the sea. Otherwise, it’s almost impossible to get in and out without risk to your feet. Also near Kampi and Agios Leon lies the village of Exo Chora in the Vrachionas Mountains. It is a sparsely populated and green area with stunning views on the Schiza Bay. 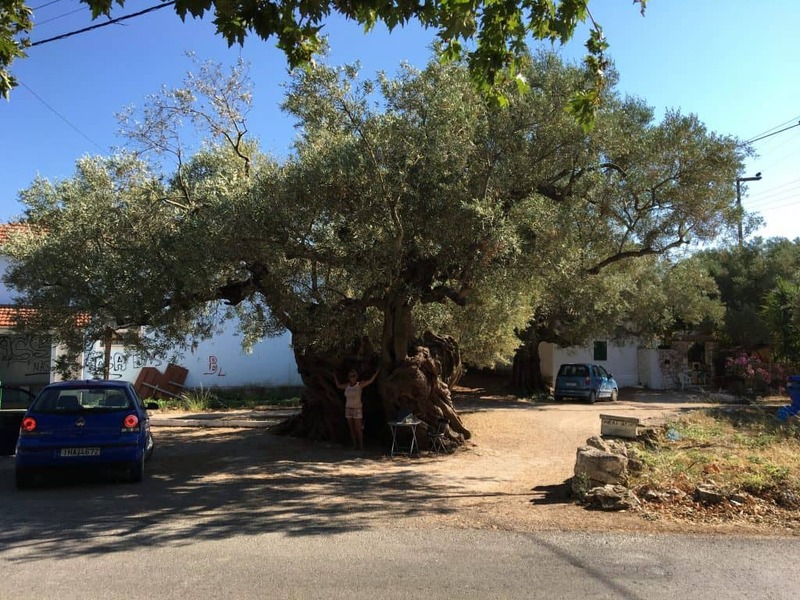 On the village square of Exo Chora you will find what is reputed to be the oldest olive tree on the Island of Zakynthos. Some say it’s more than 2000 years old! 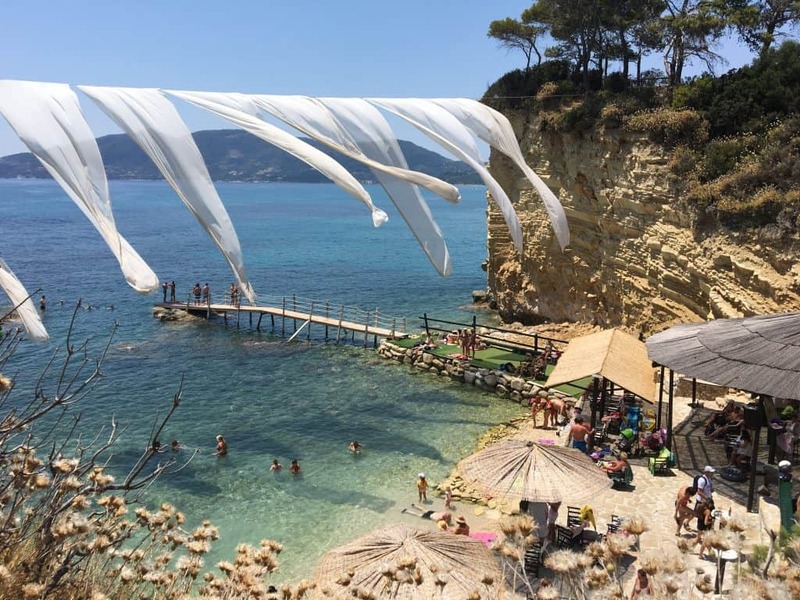 In the north of Zakynthos, you will find a special pebble beach — Xygia Beach. There is a tavern where you can park the car. Beach access is available via a steep path. The sea water here has a milky color and has a rejuvenating effect on the skin because of the sulfur and collagen. The sulfur comes from the nearby cave and has healing effects for people suffering from rheumatic diseases. In addition, it is said to be helpful in relieving all kinds of skin diseases and even in reducing cellulite. However, you will have to get used to the penetrating sulfur scent (read: rotten eggs). On the beach you can rent beds and umbrellas, but there are no sanitary facilities. 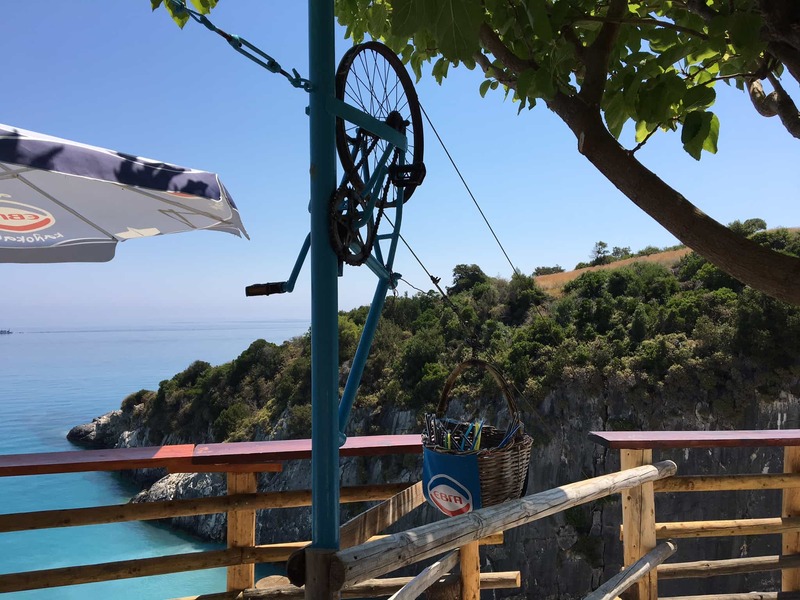 Food and drinks can be ordered and are transported from the tavern to the beach via a basket in a special cable car made of bicycle parts. What ingenuity! From the west coast it is about an hour and a half drive to the other side of the island. The distances are not large, but it’s slow moving because of the many mountain roads with sharp turns. 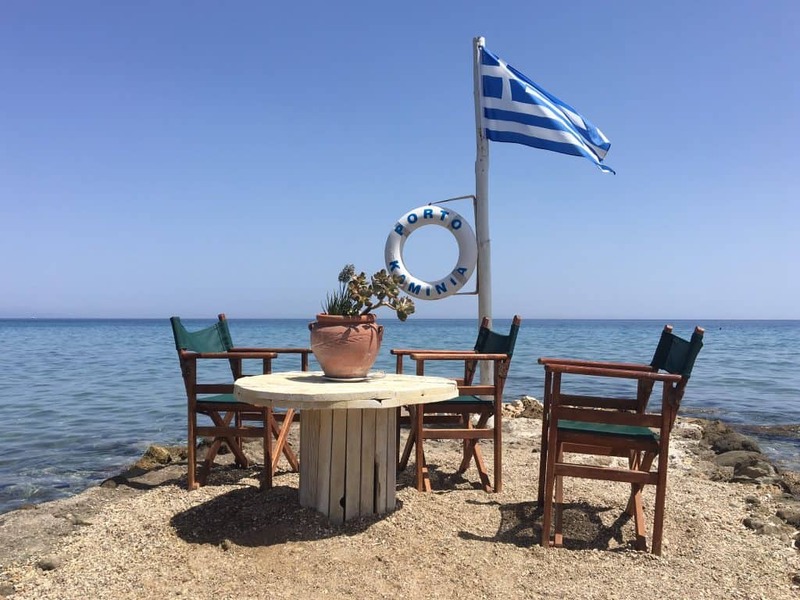 In the southeast we visited Agios Sostis and the small Cameo Island. Cameo Island is located on the coast of busy Laganas. Here you will find many English tourists and bars. From Laganas you can rent a boat for a few hours or a day to explore the coast for yourself. A long wooden walkway leads you to Cameo Island. For 5 euros you will receive entrance to the island including a drink. Tucked away at the back of the island you will find a modern beach club where they play nice contemporary music. The club represents a totally different hip world that you can’t see from the front of the island. It is a nice for a break of a couple of hours, but not if you want to relax on the beach. It is usually very busy. This is our favorite beach on Zakynthos. If you are a snorkeling enthusiast, do not miss this place! You must have good steering skills to get there. You reach this beach only by a largely unimproved road, which is both very steep and narrow. The beach has a dark color and descends very gradually. There are several taverns along the beach. The taverns and hot beach are only open during the daytime hours so as to not disturb the nesting turtles. Wooden gates are installed to protect the nests of the Caretta turtles from wandering tourists. The Caretta turtle is one of the oldest species in the world and can be a meter long as a mature animal with a weight of 100kg. They live to the ripe old age of 65 years on average. The turtles nest once every 2 to 3 years during the nighttime hours. On average, the females lay 100 eggs as big as ping pong balls. As soon as the eggs come out, the little turtles feel attracted to the light of the moon and the stars and walk to the sea. For this reason, the taverns are closed at the beach after sunset to not disorient the baby turtles. Snorkeling here is a great experience almost like swimming in an aquarium! The sea water is crystal clear and you can see for many meters underwater. Thousands of fish, with beautiful colors, swim in schools very close to you. Floating on the water with a mask puts you up close and personal with many of the fishes, but for divers it can be even more of a paradise! In Alykes, there is a beautiful wide, slowly descending beach. Here you will find many families with children (2 beds with mattresses + umbrella are 6 euros per day). Banana Beach is busy attraction with a lot of fun for young people (2 beds with mattresses + umbrella are 10 euros, without mattress only 6 euros). 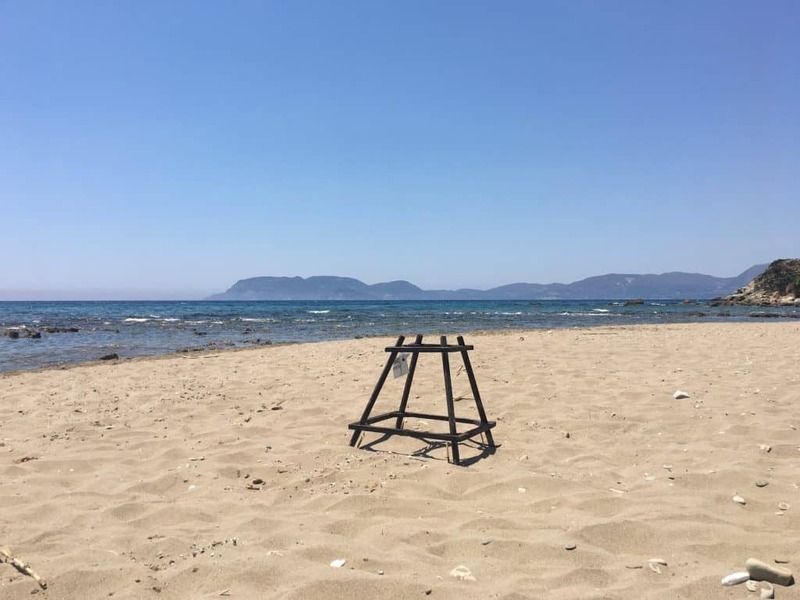 Makris Gialos Beach (2 beds without mattress + umbrella 8 euros). Tsilivi, a beautiful but busy wide sandy and slowlt descending beach. Mostly English tourists (2 beds with mattresses + umbrella 10 euros). 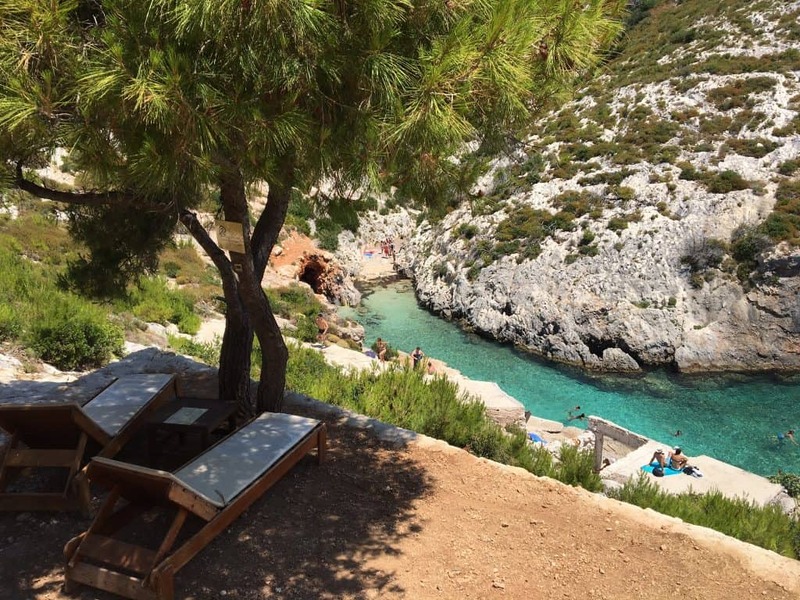 Porto Kaminia, small bay with pebble beach and free beds. Features a cozy tavern right on the beach. In brief, Zakynthos is an island where you can have a wonderful beach holiday for a week. But if you are fortunate enough to be here for several weeks, you can remain excited, because the island is so diverse with great venues to please everyone. A side excursion to Kefalonia is also highly recommended, especially because Kefalonia has not really been discovered by many tourists. You can experience the true Greek life here! his article was written by Ineke. 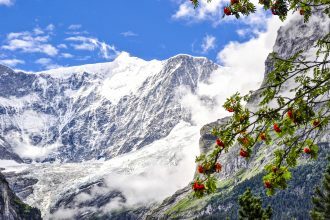 After completing her studies as a travel advisor, Ineke gained years of experience guiding travellers to the holidays of their dreams! Her own personal travels have etched dreams of the world map in her imagination! It is not crazy that almost every holiday she takes with her husband is filled with trips either inland or abroad. She loves to discover new places, sniff new cultures, and is crazy about good food (and wine). At this very moment she may be trying to discover another of the most beautiful beaches in the world! It is not crazy that the operator of this web site is Ineke’s only daughter! The travel bug certainly lives in these genes!